One could make the case that Yale professor Joanne Freeman is obsessed with people getting shot. And we should be grateful. Freeman, who has devoted much of her professional writing to the twin subjects of dueling and Alexander Hamilton, has produced one of the best books of the year, and one of the best histories of antebellum America written in many years. That’s a lofty statement for a field in which the competition is both deep and wide. 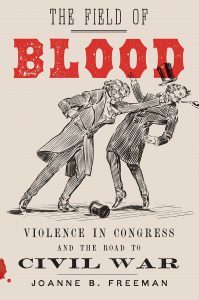 But The Field of Blood presents such a holistic examination of the American character in a seemingly micro-venue—Congress in the 1840s and 1850s—that it forces us to reexamine how we’ve understood and interpreted the runup to the Civil War. That is a monumental feat in itself. The fact that she manages to tell a heck of a story in the process puts the lie to the oft-asserted (and sometimes correct) claim that academics can’t write. This is a great book. The Field of Blood can be seen as a sort of second volume of Freeman’s “Violence in Washington” chronicle. Her Affairs of Honor: National Politics in the New Republic (2001), explored how politics in the first years after ratification of the Constitution were dominated by the rituals of the culture of honor. Carrying the story decades further into the early republic in her new book, Freeman notes the continuity with the first volume while—like the country itself—taking a turn toward an ever more violent confrontation over the fate of the union. Freeman’s research is prodigious. But she has done much more than simply compile a vast record. Her mastery of the detail is what gives the story its life. John B. Dawson, a Louisiana Democrat all but lost to history, was a demographically typical lawmaker of his day—college educated, a planter and newspaper publisher, from a well-to-do family, with state legislative experience. He also “routinely wore both a bowie knife and a pistol, and wasn’t shy about using them in the House chamber.” He used each in threatening abolitionist lawmaker Joshua Giddings of Ohio. Dawson was so notorious that Charles Dickens singled him out for notice during his well-chronicled 1842 tour of Washington. These types of detail can yield a metaphorical fist pump (and maybe a real one) from researchers upon discovery, knowing they add a vivid immediacy to the narrative. Freeman’s mining of French’s diary is worth a fist pump or two, as well. The picture painted by this accumulation of telling detail is like a pointillist painting. As you’re reading, the points pile up in something of a blur. By the time you reach the end and can step back to take in the whole thing, you see the masterpiece. But the result is more disturbing Michael Creese skull than charming calmness of a Sunday in the park with George. She begins with the notorious Cilley-Graves affair in 1838, in which Rep. William Graves of Kentucky killed Rep. Jonathan Cilley of Maine in a duel, even though the men had no particular argument with each other. A newspaper editor unhappy with Cilley, who had accused the journalist of bribery, had asked Graves to deliver a challenge to the Maine man. When Cilley refused to accept the missive from Graves, the Kentuckian considered it an insult to his honor worthy of a challenge. Graves would shoot Cilley dead in a duel fought just across the Maryland state line from the District of Columbia. From there Freeman steers the reader through nearly twenty years of threats, intimidation, fisticuffs, knife play, and gun play, reaching a crescendo with the infamous attack on Massachusetts Sen. Charles Sumner in May 1856 at the hands of South Carolina Rep. Preston Brooks, who argued that he was defending the honor—there’s that word again—of his kinsman, Sen. Andrew Butler, whom Sumner had viciously mocked in his two-day “Crime Against Kansas” speech. Recent incidents involving physical confrontations and assaults on Republican politicians and mail bombs targeting prominent Democrats have raised questions of whether we again are seeing a mobocratic spirit abroad in the land. John Bicknell is the author of Lincoln’s Pathfinder: John C. Fremont and the Violent Election of 1856 and America 1844: Religious Fervor, Westward Expansion and the Presidential Election that Transformed the Nation.